 Intercultural competence (IC) has been promoted by many educationalists as the most exalted type of competence in modern foreign language teaching (FLT). Among the difficulties to incorporate IC into FLT can be due to the fact that teachers may not have sufficient knowledge on the concept. To test this hypothesis, we attempt to answer the following question: how do Algerian English as a foreign language (EFL) teachers perceive the concepts of culture and IC as well as the objectives of the intercultural approach (ICA) in English language teaching (ELT) contexts? The present study proceeds to analyze teachers’ knowledge, perceptions and understanding of the concepts of culture, IC and the ICA and seeks to identify any potential deficiencies that may hinder effective IC teaching. The main aim of the study is then to help teacher trainers establish training programs that address more efficiently targeted teachers’ needs with regard to IC teaching. This paper will hopefully assist in improving the implementation of IC into FLT classrooms. Data were gathered through semi-structured interviews with eight teachers and then analyzed thematically. 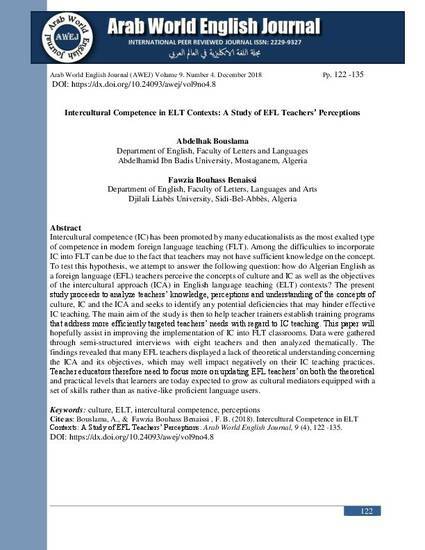 The findings revealed that many EFL teachers displayed a lack of theoretical understanding concerning the ICA and its objectives, which may well impact negatively on their IC teaching practices. Teacher educators therefore need to focus more on updating EFL teachers’ on both the theoretical and practical levels that learners are today expected to grow as cultural mediators equipped with a set of skills rather than as native-like proficient language users.